(MINNEAPOLIS) — Augsburg College at 10:15 a.m., today, welcomes it’s most diverse, first-year undergraduate class — with more than 45 percent persons of color. At the same time, the College is announcing its initial equity framework to remove the social, institutional and individual barriers that contribute to inequity. This important work garnered support from the St. Paul Foundation — a grant of $10,000 and the opportunity for additional funding as the framework takes shape. 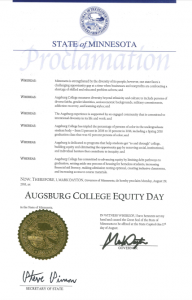 “Working to foster diversity and inclusivity has been a cornerstone of the Augsburg promise for many years and is an important extension of our commitment to social justice and equity,” said Augsburg College President Paul Pribbenow. Since 2006, Augsburg has more than tripled the percentage of persons of color in the full undergraduate student body, growing from 11 percent in 2006 to 33 percent in 2016. Through this work, the College has earned a leading reputation for demonstrating a unique way of engaging in the work of higher education. Within the Minnesota Private College Council, the overall enrollment average among schools includes 27 percent first-generation students and 20 percent Pell-eligible students. Augsburg leads the state among private, four-year institutions with nearly 50 percent of students who are first-generation and more than 40 percent of students who are Pell-eligible. The Star Tribune featured Augsburg’s annual City Service Day, an opportunity in which members of the College community venture off campus to complete service work in Minneapolis neighborhoods. The publication showed a student working at Stones Throw Urban farm, one of nearly two dozen community sites where Auggies assisted with cleaning, painting, gardening, and more. View the image on the Star Tribune site. Minneapolis-based nonprofits will receive $25,647 worth of service work on Sept. 2 from more than 420 Augsburg College students. 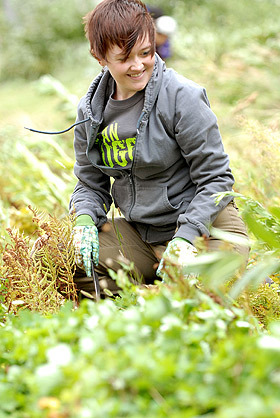 The students, in partnership with faculty and alumni, will donate 1,055 hours of work to more than 25 organizations as part of the 17th annual Augsburg College City Service Day. 1:30-3:30 p.m.: Students perform volunteer work at sites ranging from making honey, urban farming, and lake clean up to helping teachers prepare their classrooms, conduct recreational activities with youths, and clean and/or move offices and facilities. City Service Day is in its 17th year and is an annual kick-off of the academic year designed to connect incoming students with one another and within their areas of study, familiarize students with the Cedar-Riverside and neighboring communities, and ask students to live out the College mission. Augsburg College is set in a vibrant neighborhood at the heart of the Twin Cities, and offers more than 50 undergraduate majors and nine graduate degrees to nearly 4,000 students of diverse backgrounds. Augsburg College educates students to be informed citizens, thoughtful stewards, critical thinkers, and responsible leaders. The Augsburg experience is supported by an engaged community that is committed to intentional diversity in its life and work. An Augsburg education is defined by excellence in the liberal arts and professional studies, guided by the faith and values of the Lutheran church, and shaped by its urban and global settings. On the day before fall semester classes began, incoming first-year and transfer students participated in service projects in the neighborhoods that surround Augsburg’s campus. City Service Day has become an Augsburg tradition that not only helps students learn about the community but also introduces them to organizations where they can continue to serve and learn throughout their education. Editor’s Note: On Tuesday afternoon, the Cedar-Riverside and Seward neighborhood will be filled with first-year Auggies, faculty members, staff members, and members of President Pribbenow’s Cabinet. Why is service important? In his latest blog post, President Pribbenow addresses that question. A copy of the blog post is below. 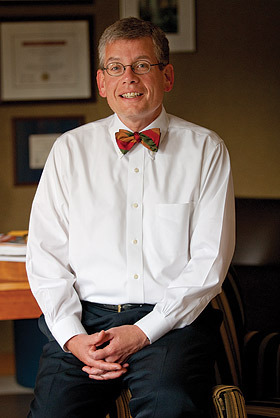 Find “Paul’s Blog” on the Augsburg College President’s webpage.